Dr. Nadeem Ehsan has vast experience of Engineering & Project Management assignments at National and International level. He has worked as Project Director for NASA on a project for “Intelligent Unmanned Aerial Vehicle for Bio Sphere Monitoring”, from 1989 to 1992. He has also worked in University of Michigan Transportation Institute (UMTRI) from 1989 to 1993 on research for the evaluation of damage caused by the trucks and other heavy vehicles on roads. 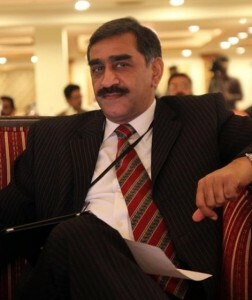 He is a leading figure in the field of Engineering & Project Management. In recognition to his services at various National Level Projects, he received Presidential Pride of Performance award in 2003. He has also been awarded Sitara-i-Imtiaz in 2008. 1 Comparative study of stationary flats on C-60 V7 Q-pack carding machine with different wire points per square inch and its impact on waste percentage, cotton fiber behaviour and yarn quality.Procedia Technology 1 (2012): 205-210. Topic: Co Authors: Jameel, Asim, Ebtisam Mirza, and Muhammad Waseem Bhatti. 2 	Analysis of proliferation of broadband sector in Pakistan. In Computer Science and Information Technology (ICCSIT), 2010 3rd IEEE International Conference. Topic: Co Authors: Farooq-e-Azam, Malik, MusabUmair Malik, Fahad Ahmed Khan Niazi, and Ebtisam Mirza. 3 	Notice of Retraction Impact of raw information on prudent decision making. In Computer Science and Information Technology (ICCSIT), 2010 3rd IEEE International Conference. Topic: Co Authors: Hanif, Huma, Usman Hanif, Ibtisam Mirza, and Hanif Ahmad. 4 	Factors affecting Broadband proliferation in Pakistan and initiatives/measures taken by the Government of Pakistan.Procedia Technology 1 (2012): 250-257. Topic: Co Authors: Jameel, Asim, Ebtisam Mirza, and Muhammad Waseem Bhatti. 5 	Database model for traffic routing and planning parameters in commercial Microwave networks.Procedia Technology 1 (2012): 230-238. Topic: Co Authors: Chughtai, HassanJaved, Ebtisam Mirza, and Sheikh ZahoorSarwar. 6 	Strategy for Introducing 3D Fiber Reinforced Composites Weaving Technology.Procedia Technology 1 (2012): 211-216. Topic: Co Authors: Golra, Owais Anwar, Jawad Tariq, and Ebtisam Mirza. 7 	Solar Powered UPS.Procedia Technology 1 (2012): 217-224. Topic: Co Authors: Jawaid, Haris, Ebtisam Mirza, and Muhammad Waseem Bhatti. 8 	Integration between customer relationship management (CRM) and data warehousing.Procedia Technology, 1, 239-249. Topic: Co Authors: Khan, Abeer, Ebtisam Mirza, and Sheikh ZahoorSarwar. 9 	The impact of employees’ project commitment and its effect on IT industry of Pakistan.Procedia Technology 1 (2012): 258-261. Topic: Co Authors: Gulzar, Mohsin, Naeema Arshad, Ebtisam Mirza, and Maria Hafeez. 10 	Modulated IR laser re-transmitter using Optical Laser Communication. In Computer Science and Information Technology (ICCSIT), 2010 3rd IEEE International Conference. Topic: Co Authors: Khan, Muhammad Altaf, Ahmad Jamil, and Muhammad Wasim Bhatti. 11 	Formulation of road asset management system of Pakistan. In Remote Sensing, Environment and Transportation Engineering (RSETE), 2011 International Conference. Topic: Co Authors: Rabia, Ms, EngrSarfaraz Ali, and Ibtisam Mirza. 12 	Notice of Retraction Forming a model of brand loyalty development—An empirical study of Pakistani consumer market. In Computer Science and Information Technology (ICCSIT), 2010 3rd IEEE International Conference. Topic: Co Authors: Naseer, Sana. 13 	Notice of Retraction Disaster risk management and role of Pakistan's corporate sector. In Computer Science and Information Technology (ICCSIT), 2010 3rd IEEE International Conference. Topic: Co Authors: Abbas, Syed Aamir, Sahban Zafar Ali, Ebtisam Mirza, and Muhammad Wasim Bhatti. 14 	Probable causal factors in UAV accidents based on human factor analysis and classification systems. International Congress of the Aeronautical Sciences. Topic: Co Authors: Asim, Muhammad, and Khalid Rafique. 15 	implementation and security concerns. In Computer Science and Information Technology (ICCSIT), 2010 3rd IEEE International Conference. Topic: Co Authors: Malik, MusabUmair, Farooq Malik, Fahad Ahmed Khan, and Ebtisam Mirza. 16 Effects of organizational culture on psychology of employee commitment. InIndustrial Engineering and Engineering Management (IE&EM), 2011 IEEE 18th International Conference. Topic: Co Authors: Rizvi, Syed Zahid Raza, Muhammad Waseem, AsimNisar, and Syed Kazim Raza Naqvi. 17 	Impact of goal clarity on organizational commitment in telecommunication organizations of Pakistan. Working paper, 12th International Business Research Conference, 2010. Topic: Co Authors: Khan, Zeeshan, Hina Ali, and Ebtisam Mirza. 18 	A strategic framework for requirements change in technical projects: Case study of a R&D project. In Computer Science and Information Technology (ICCSIT), 2010 3rd IEEE International Conference. Topic: Co Authors: Hussain, Sabeen, and ShaziaNauman. 19 	Information technology: A means of quality in healthcare. In Computer Science and Information Technology (ICCSIT), 2010 3rd IEEE International Conference. Topic: Co Authors: Ahmed, Adeel, Ebtisam Mirza, Suleman Ahmad Awan, and AzamIshaque. 20 	An investigation of changing requirements with respect to development phases of a software project. In Computer Information Systems and Industrial Management Applications (CISIM), 2010 International Conference. Topic: Co Authors: Bhatti, Muhammad Wasim, Farah Hayat, AzamIshaque, Sohail Ahmed, and Sheikh ZahoorSarwar. 21 	A methodology to manage the changing requirements of a software project. In Computer Information Systems and Industrial Management Applications (CISIM), 2010 International Conference. Topic: Co Authors: Bhatti, Muhammad Wasim, Farah Hayat, AzamIshaque, Sohail Ahmed, and Ebtisam Mirza. 22 Notice of Retraction Risk management in construction industry. In Computer Science and Information Technology (ICCSIT), 2010 3rd IEEE International Conference. Topic: Co Authors: Ebtisam Mirza, MehmoodAlam, and AzamIshaque. 23 Impact of Quality Certification on Software Industry of Pakistan. International Association of Technology, Education and Development INTED2010 Spain ISDN:978-84-613-5538-9 Topic: Co Authors: M. Ajmal Khan, H. Rehman, E. Mirza, and A. Ishaque.